We had initially agreed to co-operate with HimalAsia. HimalAsia had put the Nepalese NGO Sahayog Himalaya-Nepal in charge of implementing the project. However, during our joint project visit in August/September 2007 we soon realised that direct and exclusive co-operation with Sahayog Himalaya-Nepal was more appropriate. Following approval by HimalAsia and the board of Esel-Initiative, a new agreement on co-operation was concluded. Sahayog Himalaya-Nepal was founded in 2005 by Laxmi Gauchan. It is a registered NGO. 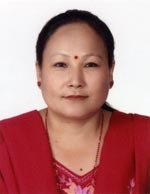 Laxmi Gauchan continues in her position as chairperson and is personally supervising the project of Esel-Initiative. She was born in Mustang and is living and working there and in Kathmandu. A mother of two grown up children, she has many years of experience as a social worker and has been actively committed to the education of girls from poor families long before the founding of Sahayog Himalaya-Nepal. Sahayog Himalaya-Nepal works to sustain the poor through education of girls and women, income-generating measures for poor women, promotion of hygiene and health, cultivation of vegetables and medicinal plants and protection of the environment. The seabuckthorn project in Mustang was started by Laxmi Gauchan. She organises training, collection and processing of the harvest etc. Sahayog Himalaya-Nepal is relatively small since only persons who successfully worked for it over several years on a voluntary basis are accepted as members. Among other activities, Sahayog Himalaya-Nepal works closely with mothers' co-operatives, which in many Himalayan villages are the driving force behind sustainable development. As this NGO has a very good network, especially in the Himalayan districts, it is well able and prepared to implement the project in the entire mountain region and - if donations increase - also in other poor regions of Nepal.